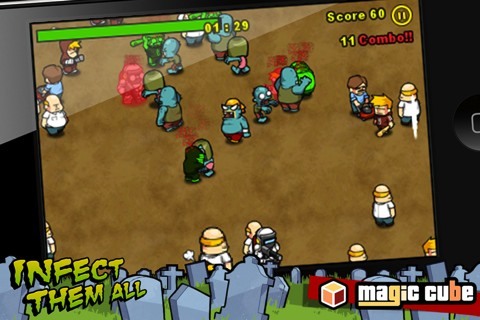 Infect Them All is an app for those who love zombies in any shape or form. In this game you get to play as one of the undead but also as the source of the infection. By feeding on humans but not killing them, you’ll convert them into a zombie which in turn makes more zombies. Their frailty stops them from being too powerful. As the head zombie, you’ll gradually lose health but eating will get it back up. Beating a stage requires you to infect and/or kill all humans. The Infect Them All app was developed by Magic Cube and runs on the iPhone and iPod Touch running iOS 3.0 or higher. This game has simple controls. You select the controls you want to use which are tilt with auto or fixed calibration or joy pad. I picked joy pad since it’s easier for me to get use to. You move one of the five zombie characters (each one has varying stats) you selected to a human and start feasting on him or her. From there you can choose to eat until they burst into a shower of blood or by tapping the screen which will free the human and eventually it will become a zombie. An infected human is green until it becomes a zombie. When a human turns into a zombie it will help you infect other humans until it dies. You can use the zombies as shields to protect you from attacks such as bullets and what not. Your health will drain while you play and the only way to refill it is to eat more brains. The amount of health you regain depends on how long you eat. Killing a human this way will refill some more health but you won’t get support. Each human has his or his own abilities and varying amount of hits it would take to be able to feed on. Money is earned by killing enemies and completing the stage. Combos also help get you extra money. This is done by attacking humans without stopping. Your zombie minions can also help with keeping the combo counter up. Money is used to upgrade your zombie’s parameters such as health, speed, damage, how fast you eat, etc. There are fifty stages in normal mode with unlockables such as infinite stages, survival, and blitz mode. Each stage gets more and more difficult but you can replay a previous stage to earn more money and upgrade your zombie so it can take on the challenge. High scores and achievements are supported by Game Center and Openfeint. The graphics for Infect Them All are 2D and they are very nice. There is minor pixilation from big enemies but other than that you have to look carefully to find it. The backgrounds are empty but show a forest or city setting. Even though the backgrounds are empty, you won’t be focusing on them since finding humans to feed on and evading their attacks are more important. There is blood being spilled so I’m not sure if anyone has a problem with that. I don’t have much more to say about the graphics but they are simple and do what they need to do. The audio for this app fits the atmosphere but it can be repetitive. The music has some nice beats. Sound effects are exactly what you think they are. Grunts, screams, hitting an enemy, getting hit, etc. are pretty much the only things you’ll hear. The audio isn’t bad; it’s just pretty standard stuff. Infect Them All sells for $0.99 in the iTunes App Store. You unlock stuff by infecting enough people. This app can be repetitive but it’s amusing to eat and convert humans. There is a lite version so if anyone is interested they can try it out and see if they’ll like it. 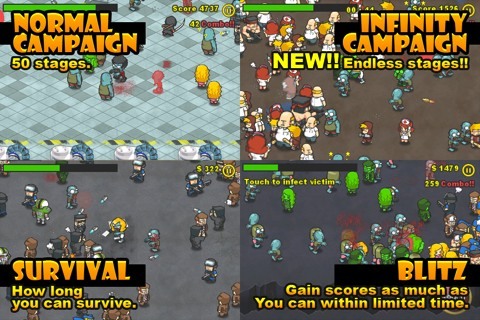 AppSafari review of Infect Them All was written by Tony Lau on April 12th, 2012 and categorized under Action, Adventure, App Store, Games, RPG. Page viewed 3956 times, 3 so far today. Need help on using these apps? Please read the Help Page.